These are exciting days over at the Port of Houston. Not only are they getting ready to celebrate their 100th anniversary in 2014, they are busy preparing for the expansion of the Panama Canal and the increase in port traffic it is expected to bring. A major step toward realizing the port’s – and the area’s maximum potential for economic development – is ensuring the Houston Ship Channel is properly maintained at its federally authorized depth of 45 feet and width of 530 feet to accommodate the deep-draft vessels that soon will be able to sail through the Panama Canal. Part of this is happening this summer and fall as Orion Marine Construction dredges the channel, removing two million cubic yards of material between Morgan’s Point and the Exxon Reach and including the Barbours Terminal Channel and non-federal berthing areas. Working under an $8.9 million U.S. Army Corps of Engineers contract it was awarded, Orion is using a hydraulic pipeline dredge to do the job, which it expects to complete in November. “This dredge work allows the Corps to fulfill its mission of providing safe and navigable waterways for vessels importing and exporting goods to and from the Port of Houston,” said Tricia Campbell, an operations manager with the Corps’ Galveston District. All the dredge material will be placed in the Spilman Placement Area, she added. Actually this is only part of the dredging picture. “About $40-$50 million in dredging is needed each year,” Spencer Chambers, the Port’s government relations director, said, adding that about $30 million has already been spent this year. With Ship Channel industries planning $35 billion in capital investments in the next two to three years, keeping the waterway at its authorized width and depth is a must, Port Bureau President Bill Diehl says. 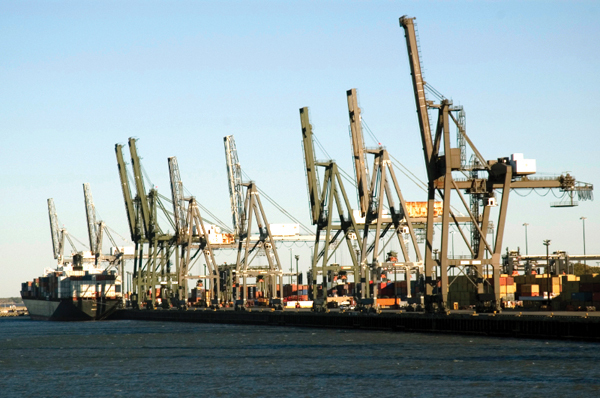 “Companies are expanding or relocating to our port region because the port gives them access to global markets. In essence, companies are saying, ‘We are investing to expand our markets beyond our shores,’” Diehl said. “The confidence of these ship channel industries, that their investments will pay off hinges largely on our ability to accommodate deep-draft vessels by ensuring that the main ship channel is properly maintained. Inadequate federal funding to finance that vital dredging intensifies that challenge,” Port Executive Director Colonel Waterworth added. 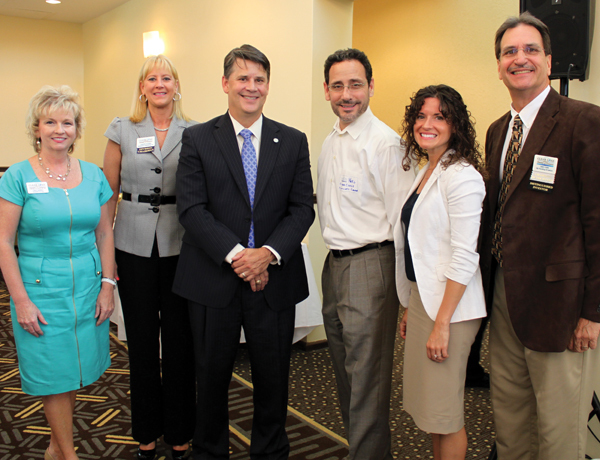 Port of Houston Authority Vice President Charlie Jenkins, third from left, updated the Clear Lake Area Chamber on Port achievements at the monthly chamber luncheon in July. With him are, from left, Chamber President Cindy Harreld, Business Development Division Chairman Janette Alford, Straterion Consulting; Karl Garcia, Clear Creek CommunityChurch; Program Chairman Charity Ellis, Advocare International; and 2012-2013 Chairman of the Board Mike Furin, My Flooring America. The Port of Houston is home to the largest petrochemical complex in the nation, and many of the other top goods move across Port Authority docks. Today, Texas is ranked as the No. 1 exporting state in the country. Not just this past year but for the 11th year in a row, 2012 statistics recently released by the U.S. Department of Commerce show. Brazil ($10.0 billion) and The Netherlands ($9.5 billion), respectively. Petroleum and coal products, chemicals, computer and electronic products, non-electrical machinery and transportation equipment were the leading export industries. A recent study by Martin Associates says ship channel-related businesses contribute more than one million jobs throughout Texas, up from more than 785,000 jobs cited in a 2007 study.